It's merely hours left for the official unveiling of Samsung’s world first quadruple-camera smartphone dubbed the Galaxy A9s at an event in Malaysia. Now today, the popular leakster Evan Blass has posted an image of the device which revealed the details regarding the rear camera setup. 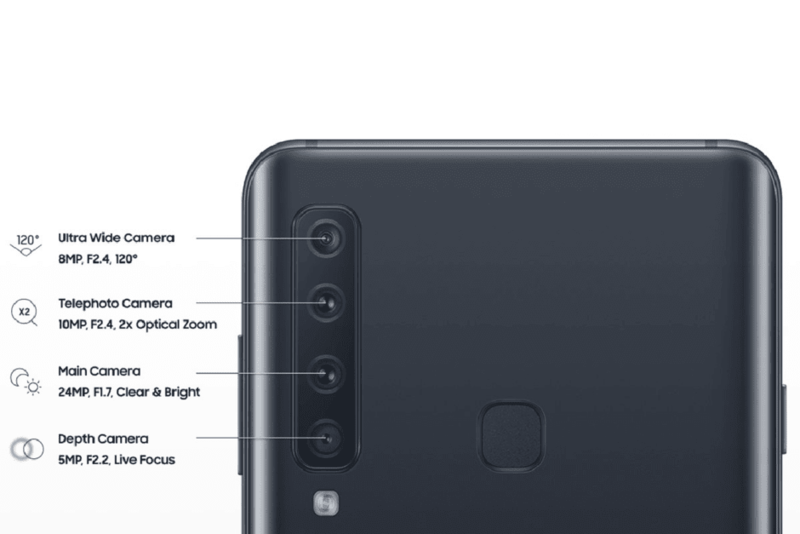 According to the leakster the device will feature four camera on the rear with a 24MP main sensor that has an aperture f/1.7 and it will presumably use “Clear & Bright” technology which will enhance images in low-light scenarios, and the second sensor will be a 5MP camera with f/2.2 aperture and it will acts as a depth sensor that is used for “Live Focus”. Similarly, there will be a 10MP telephoto camera with aperture f/2.4 and 2x optical zoom, the last one will be a 8MP camera with aperture f/2.4 and 120º wide-angle. On the front there will be a 8MP camera for selfies. Recently leaked specs sheet has revealed that the Galaxy A9s will feature a 6.28-inch AMOLED Infinity display with a resolution of 2200 x 1080p. The device will be powered by Qualcomm’s Snapdragon 660 SoC coupled with 6GB of RAM and 128GB of internal storage. The smartphone will run on Android 8.1 Oreo out of the box and will pack a 3,720mAh battery. There will be rear mounted fingerprint scanner for security and the device is said to be known as Galaxy A9 (2018) in Europe.